Bus passengers await a ride at the Harlingen bus terminal downtown. Valley Metro's bus service from Brownsville to Zapata County projects a record 700,000-plus riders this fiscal year. HARLINGEN — The Valley Metro transportation service is on the brink of surpassing 700,000 riders for the current year. 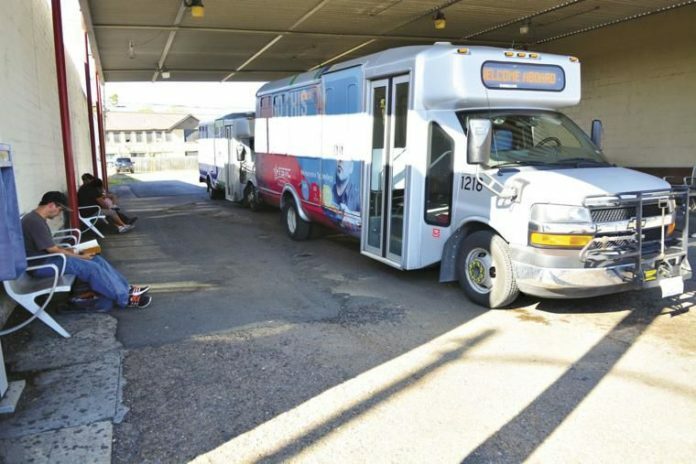 The bus service, administered by the Lower Rio Grande Valley Development Council, has recorded 593,803 passengers through June. With six weeks to go in its fiscal year, it seems certain to break its ridership record. “It’ll be a first for us, and we’re excited at the milestone,” said Tom Logan, Valley Metro’s executive director. Logan says the reason for the ridership explosion has been the success of the bus service with the Valley’s university students, who can ride buses for free thanks to partnerships Valley Metro has with South Texas College and the University of Texas Rio Grande Valley. The Vaquero Express from Edinburg to Brownsville is the most-used route with 31 percent of ridership. Route 31 from Harlingen to McAllen has 12 percent of total ridership and the JagExpress from Roma to Weslaco counts for 10 percent. “We’ve seen student ridership just skyrocket,” Logan said. “I think students are seeing the value and the benefits of using public transportation to get to and from the campuses. “Since it’s free for them because of our partnership with the institutions of higher learning, they can not only use it for school but also for any personal needs like work, or recreational or just to do any shopping,” he added. Over the next year, Logan said, Valley Metro will look at under-served areas of the Valley to determine if they may be prospects for expanded transportation services. He said groundwork is being laid for potential new routes in both Hidalgo and Cameron counties. “We are in the midst of launching the RGV Express service,” he said. “It’s going to connect the cities of Brownsville, Harlingen, McAllen and Edinburg. The RGV Express route will provide non-stop bus service from city to city without any intermittent stops.